Today we'll continue exploring the art of performance with an installment that could be easily renamed into "Theatrics for Dummies." 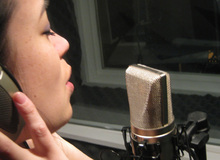 However, anyone who takes the time to put into practice these tips will see an amazing improvement in the recording of vocal performances. Cross my heart and hope to die if they don't! It's time to retake our vocal warm-up process, which we started with 10 minutes of thoracic diaphragm and vocal folds relaxation. Our purpose this time is to go one step further and deal with one of the most difficult things to achieve when singing: smooth transitions between our two main voice ranges. It's hard to do a Janis Joplin song if your voice sounds like Madonna, or to sing Springsteen with Boy George's voice. Is there a way to get a broken voice? Vocal sibilance is an unpleasant tonal harshness that can happen during consonant syllables (like S, T, and Z), caused by disproportionate audio dynamics in upper midrange frequencies. As summer arrives, singers begin to worry about vocal health as summer is the season when most artists have most bookings. "Will I be able to manage all the upcoming shows without vocal fatigue?" The health of your voice is a serious matter: Your voice is a musical instrument that requires very special care, technical skills and constant practice.